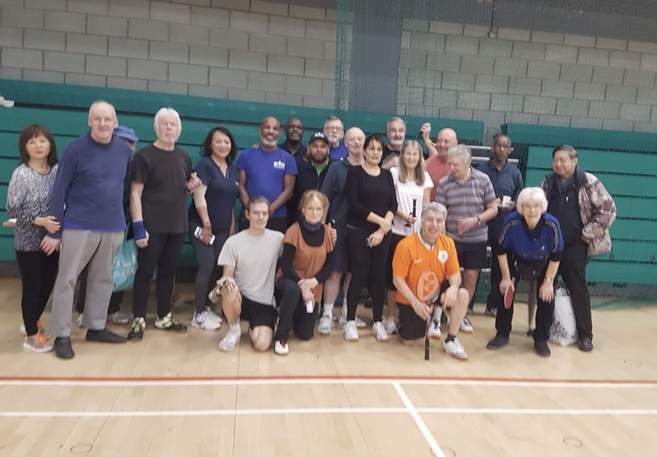 On 13th December 50 club members all aged 55 and over came to Swiss Cottage Leisure Centre’s sports hall to take part in our Christmas Party and multi sports competition. The badminton competition drew in 20 players with 16 players taking part in table tennis and another 14 competing in short tennis. Over the day members took part in games of badminton, short tennis and table tennis competing for a first place trophy in each event. All doubles games took place as mixed double to welcome all genders and abilities offering a fair playing ground to all. The games were very competitive and a lot of fun with Charles V Smith, General Manager even sneaking into the short tennis competition and playing the finalist. Throughout the games the club members shared food and snacks brought from home to show off their own cultures and cooking skills to their team mates. To end the day there was even a singing show case by one of our club games badminton competitors. The day was a huge success with a lot of fun had by everybody, staff and members alike.